Nanoil :: natural oils for high porosity hair. I HAVE HIGH POROSITY HAIR – WHAT DOES IT MEAN? Your hair is in bad condition due to several reasons – colour-treating, thermal styling, inappropriate cosmetics, harmful external factors. 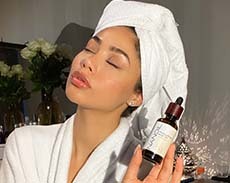 They all weaken hair bulbs and disturb scalp water-lipid balance. Consequently, it escalates damage on the hair surface. 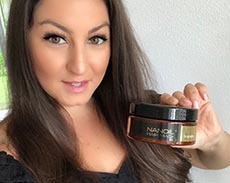 NANOIL for high porosity hair reconstructs damaged keratin structure of hair, strengthens the medulla, and seals scales. 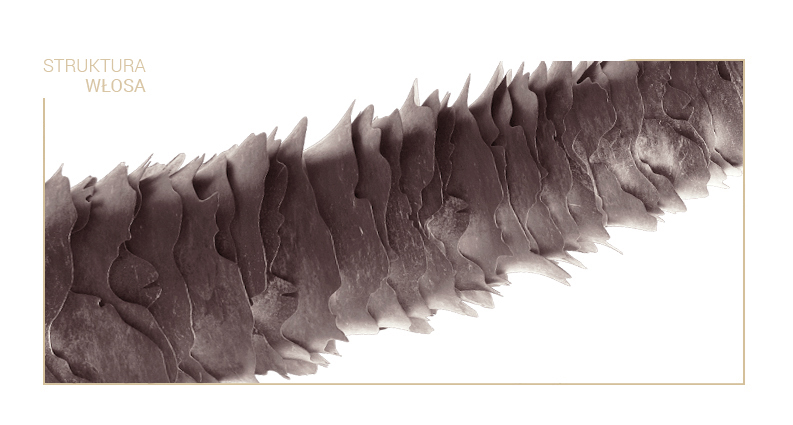 Scales of high porosity hair are raised from the shaft. Therefore, hair is exposed to mechanical damages and harmful effects of substances that face no protective barrier. 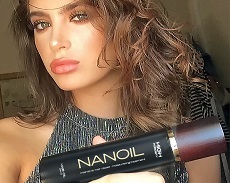 NANOIL is a remedy for such problem. The treatment nourishes and regenerates even the most damaged strands. Damaged hair is a nuisance – it is frizzy, static, dry, stiff, and dull. All attempts of improving its condition with styling cosmetics end in failure and only worsen its state. NANOIL for high porosity hair provides wisps with beautiful gloss, softness, moisture, restores resilience, and ensures healthy lustre. High porosity hair requires aid from substances that provide strong in-depth effects. NANOIL for high porosity hair contains six carefully selected vegetable oils abounding in valuable polyunsaturated fatty acids. They are enriched with a complex of essential ingredients responsible for intensifying the action of the product. Hair bulbs determine the condition of hair. 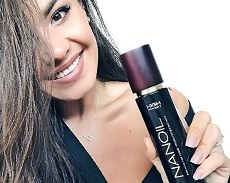 NANOIL is the only treatment that works where the problem begins – in the scalp. It maintains proper pH, stimulates blood circulation, replenishes nutrients, and strengthens the protective barrier, through improvement of the condition of bulbs. 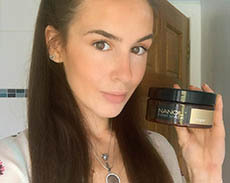 NANOIL for high porosity hair fills in gaps and seals scales. It has antioxidant properties; therefore, your hair preserves youth and resilience for longer, stops falling out, and grows faster. Oil cold-pressed from sweet almonds. It is a great smoothing emollient. Its lightweight formula provides deep moisture and nourishment and soothes irritations. It prevents brittleness. 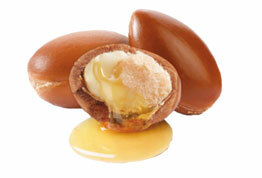 Valuable oil obtained from argan tree kernels. Not without reason, it is called the liquid gold of Morocco. 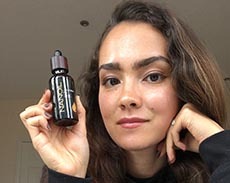 It regenerates intercellular cement and seals hair structure. Not only does it repair strands from the inside, but also protects them. 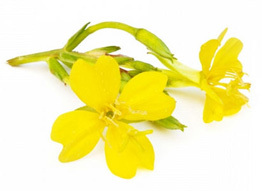 It is obtained from small seeds of Oenothera flowers. It has positive influence on the functioning of cells in the scalp. Prevents water loss, removes toxins, soothes irritations, and supports the treatment of skin problems. 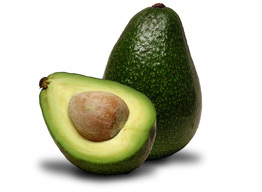 Oil of seven vitamins, cold-pressed from the pulp of avocado. This ingredient smooths hair fibre and ensures beautiful shine. Inhibits water loss, which contributes to preventing frizz and brittleness. It also tames unruly strands. 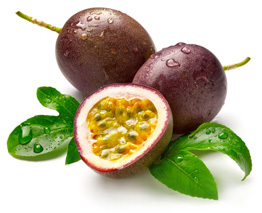 Squeezed from passion fruit seeds, improves scalp and hair resilience. It balances processes taking place inside cells and regulates sebum secretion. Therefore, it prevents greasy scalp and hair. 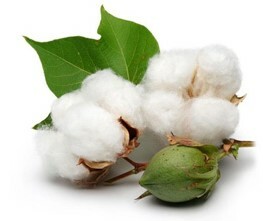 This oil derives from the seeds of cotton. It allows a true hair makeover. It is famous for its moisturising and softening properties. Therefore, it is recommended for dehydrated hair with damaged ends. 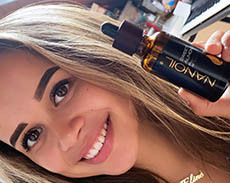 Panthenol – boosts hair regeneration, stimulates keratin production (natural material making up hair and skin), smooths, provides shine, and enhances colour. 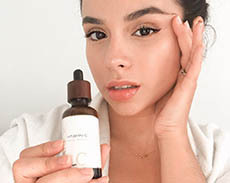 Baicapil – stimulates the work of even dormant cells, which results in the appearance of baby hair. It ensures strands with young and healthy appearance. 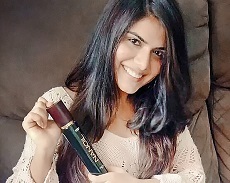 Keratin – remedy for damaged hair. It participates in rebuilding hair keratin structure and regenerates damage. UV filter – protects hair from harmful sun radiation, ageing, and dehydrating. Lanolin – an ingredient that works well with human skin structure. 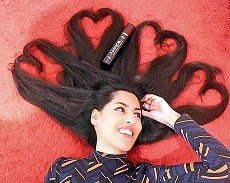 It lubricates, softens, smooths, and provides resilience to damaged hair. Improves shine and colour intensity. 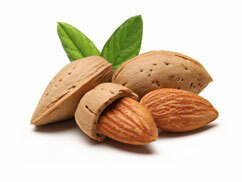 Vitamin E – very strong antioxidant that prevents keratinisation and premature scalp ageing. It enhances radiance and improves resilience. 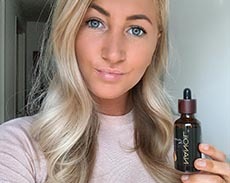 Kerastim – improves metabolism in scalp cells, in consequence inhibits hair loss, improves density, and speeds up hair growth. Silk – lightweight substance responsible for facilitating styling. It moisturises and smooths hair structure. Makes strands silky smooth and ensures outstanding gloss. 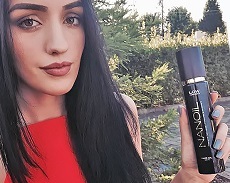 NANOIL works on high porosity hair as a healing band-aid. Your hair will remain strong and healthy long after finishing the treatment. 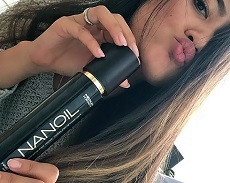 Oil works comprehensively on all problems connected with damaged hair and ensures intensive regeneration of inner hair structures. The secret of its effectiveness lies in the selection of components that work inside hair follicles, instead of only on hair surface. Damaged and weakened strands regain health, and their protective barrier is reinforced. In consequence, your wisps are resilient, strong, radiant, and healthy with noticeably better condition. 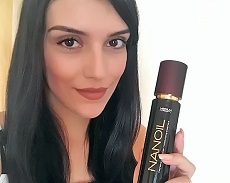 NANOIL seals scales and provides strands with smoothness and shine. 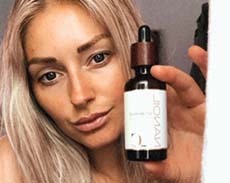 It regenerates even the most damaged hair and makes it healthy and beautiful.